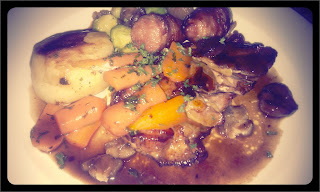 Turkey, roast potatoes, brussels sprouts, parsnips, stuffing, gravy, looseing a notch on your belt. For most Brits, the phrase 'Christmas dinner' conjures up all these images. Christmas is definitely a time when diets are relaxed and indulgence rules. In the build-up to the main festivities, it's likely you'll eat more than one Christmas meal with work colleagues or friends. And with the majority of Oxford restaurants offering festive set menus, you're spoiled for choice when it comes to choosing where to tuck into your turkey. But what if you're looking for something less traditional? If you can only face the full turkey and trimmings once over the festive period but still want to keep things festive, try No1 Folly Bridge. With a prime riverside location, this new brasserie no doubt comes into its own during the warmer months, when the terrace opens up. However, it's also a lovely spot for dinner at any time of year, with its white walls, light wood furniture and candlelit alcoves. The main menu changes with the seasons, offering well-priced French-influenced meat and fish dishes (such as swordfish steak, £12.75) along with a selection of stone-baked pizzas. The Christmas menu offers even better value, though: 3 courses for just £19.95. With 4 options for each course, we weren't limited on choice, but at such a good price, would the dishes deliver? A, N and I greedily sampled one of everything on No1 Folly Bridge's Christmas menu, starting with baked goat's cheese salad, a salmon and prawn tartlet, parsnip and celeriac soup and a ham hock and game terrine. I admit I wouldn't usually opt for soup as a starter, but a taste of this creamy, subtle yet rich tasting parsnip and celeriac number had me rethinking my ideas. Notoriously fussy N also loved it, but preferred the terrine: both my carnivorous companions said that it was a real meat lover's dish, densely packed with good quality meat, and offset well by a cranberry relish. The salmon and prawn tartlet's buttery pastry and smooth flavours won me over, while the goat's cheese salad with roasted pear and walnut provided an interesting taste combination. It was probably my least favourite though, as the salad seemed to dominate: the toasted goat's cheese would have packed much more of a punch without the lettuce leaves. 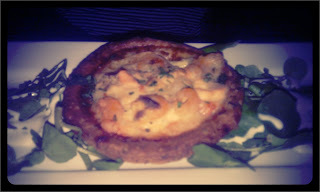 Suitably impressed by our starters, we had time to rest our rapidly-filling stomachs before the main event. We were all surprised to note the absence of turkey from the menu: traditionalists may not approve, but would no doubt be appeased by the roasted pheasant (shot that morning and prepared in-house) served with pigs in blankets, honey and parsley carrots, fondant potatoes, sprouts and chestnuts. A and N were certainly impressed: it was wintry and festive without following the usual Christmas dinner format; the roasted meat was tender and juicy, with a lasting flavour; the chestnuts and pigs in blankets were singled out for particular praise. Although my pescetarian ways prevented me from trying any of the pheasant, I was impressed by the portion size – the low price doesn't translate into small servings. 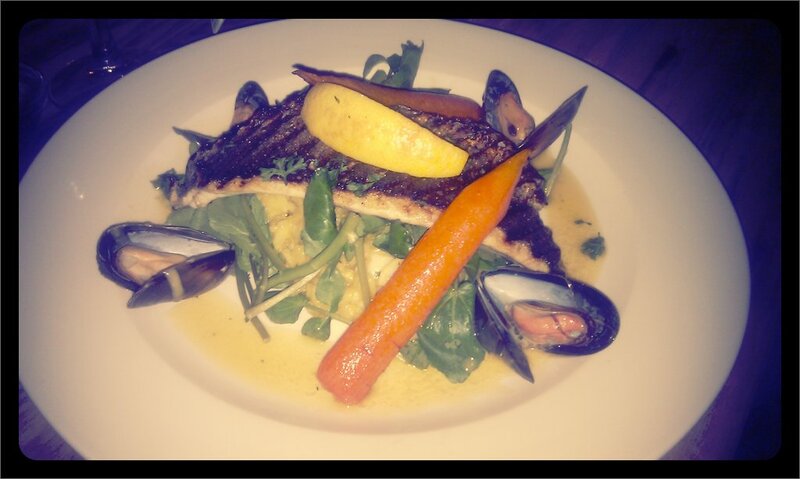 Although less festive, the crispy sea bass was a hit with me. Light yet substantial, the flaky fish was served atop a squid ink and saffron risotto, which gave substance to the dish. The advertised carrot fritters actually took the form of roasted carrots, which lent a more seasonal feel. 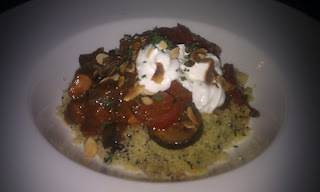 The roasted vegetable tagine also hit the mark. So many Christmas menus offer vegetarian options which feel like the meat dishes' poor relations: a lacklustre cheese tart or vegetable filo parcel, or even decidedly un-festive dishes such as Thai curry. I was impressed that No1 Folly Bridge offered something different: an appealing, satisfying dish which used seasonal root vegetables in order to retain that wintry feel, but that didn't try too hard to fit a 'Christmas formula'. The portion size was also impressive, the tagine packed with tomatoes, courgette, sweet potato and more, garnished with fresh herbs and flaked almonds. 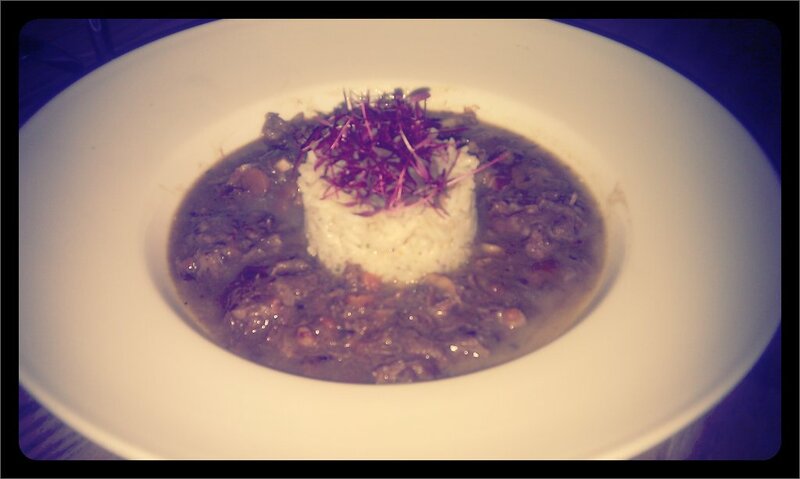 The beef bourguignon served with rice failed to impress, though. Although the beef was sourced from a small free-range farm, it hadn't been made the most of, and the dish was less flavoursome than the other options and even a little watery. Stomachs suitably stuffed, we still had 4 desserts to contend with. Once again, No1 Folly Bridge has dispensed with tradition, omitting Christmas pudding from the menu. After such sizeable portions, none of us could have faced a heavy pudding anyway, so were happy with the choices of lemon cheesecake, profiteroles, apricot tart and raspberry and melon melba. Although the latter sounded like the least interesting dessert, it actually proved to be the star: served in a cocktail glass, we were expecting a melon-flavoured jelly but found melon balls drenched in a thick, syrupy raspberry flavoured liquid and topped with a delicious raspberry and strawberry sorbet. Traditional it wasn't, but it was a (relatively) light way to round off the meal. The lemon cheesecake was also excellent: creamy but not too dense, it features low fat cream cheese – a few calories saved! The profiteroles definitely weren't waistline friendly. Filled with a gorgeous (full fat) cream and smothered in warm chocolate sauce, I kept going back for more despite being stuffed. The apricot tart was nice enough, but overshadowed by the deliciousness of the 3 other desserts. With a lovely location and a strong menu that succeeds on almost every dish, No1 Folly Bridge is well worth a visit, whether it's over the festive season or not. Although this site has been through a number of hands in recent years, hopefully the current owners will manage to stick around for a while. Given the quality of their offer and the fact that the restaurant was almost full on a Wednesday evening, things are looking good. No1 Folly Bridge is at No1 Folly Bridge, OX1 4LB. Tel: 01865 201293. The Christmas menu is also available on board the restaurant's boat – see website for details. I love that this restaurant had a Christmas menu! I'm going home for Christmas this year, but not until the day before. How cool to get in the spirit all month whenever you want -- thanks to a professional chef! Yes, it definitely helped us to get into the festive spirit! And if the Christmas meal is good value as well, then even better. I really want a baked goat cheese salad. NOW. Love this kind of menu.